The worlds of Psych and Chuck are about to collide. Recently, stars Dulé Hill and James Roday revealed Zachary Levi will star in USA’s upcoming Psych movie, TVGuide reports. After three years off the air, USA Network announced they’ve ordered a Psych TV movie that will reunite the cast of the detective dramedy. Returning stars include Hill, Roday, Corbin Bernsen, Kirsten Nelson, Maggie Lawson, and Timothy Omundson. What do you think? 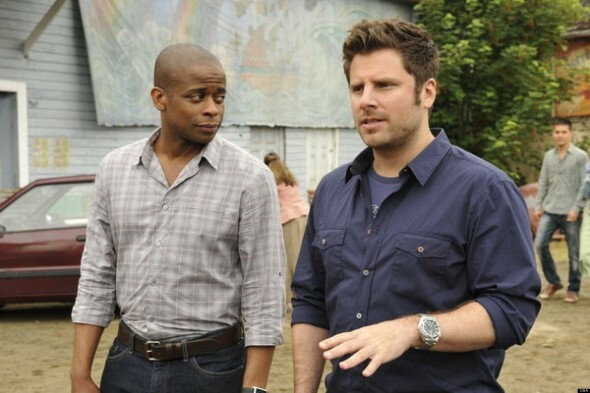 Are you a fan of Psych? Will you watch the new TV movie? I love this show . Can’t wait to see it. I can’t wait for this! I loved this show. Can’t wait. Loved the show and hated seeing it canx’d.